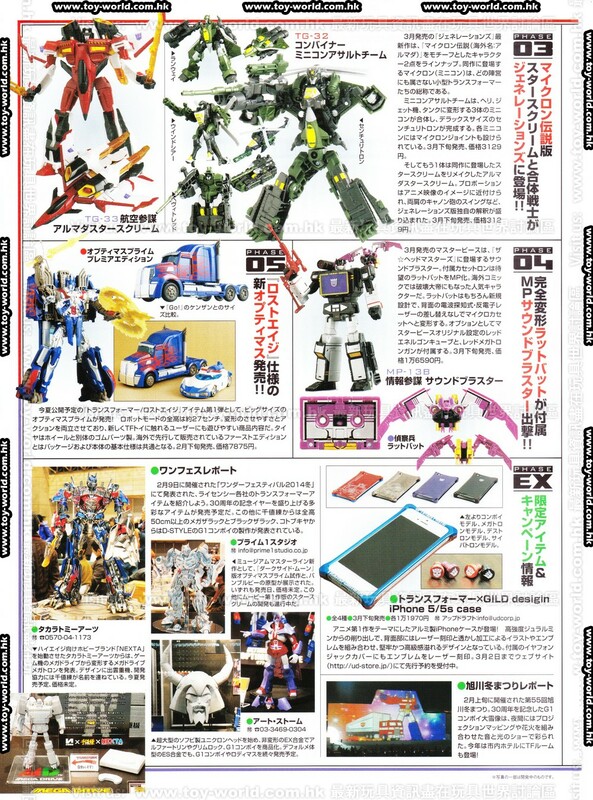 By way of Toyworld.com.hk, we have some scans of the April 2014 edition of Figure King magazine. Not a lot of previously unseen stuff this month, coverage includes the Transformers Cloud Brawn and Starscream, the Japanese release of Generations Armada Starscream and the Mini-con Team, First Edition AOE Optimus Prime, Masterpiece Soundblaster and Ratbat, the Transformers iPhone 5 cases, and some coverage of the items shown at Wonder Festival. Rounding out the coverage is an interview with Shogo Hasui, the translation for which you can check out here. I love the Hasbro version but I'm buying the Takara version of Armada Starscream as well, I just love these designs so much. I love how colorful Transformers are, and how it's not just a few dominant color schemes over and over again. Now Takara, where is your Generations Rattrap, hmm? ^Yeah I like him a lot myself, but I haven't even seen Hasbro one in person. Hoping for the best. Me, too. I don't mind buying non-transforming figures every now and then, but a statue is where I draw the line. Wow Takara Armada Starscream looks awful. It's even MORE garish. Can't tell if you're being sarcastic here. He looks a LOT closer to the animation than the Hasbro release. I am liking this MP13B more than MP Soundwave. Man, wish there was an easy way to get Ratbat by himself. Just wait for Hasbro to release Soundblaster + Ratbat for cheap. I'm pretty sure it'll happen down the road. I can't wait though, got it for $105 at Anime Export. I don't get it though because a big part of the appeal of having both is the color combination. A pink cassette and a purple/black Soundwave looks awesome. That'd be the G1 Toy in the picture. Can't wait for Soundblaster and his nice red Megatron gun. That Alpha Trion looks cool. I'd buy a MP Alpha Trion if they made one too. Yeah I don't know about $20, but you can watch AmiAmi towards month's end and see if they put it back up for preorder/sale immediately before or after they get their stock in. Or stalk HLJ. They got extra Waspinator and Rhinox so they might get more Armada SS. Don't expect to pay less than $23 though. They are from a company called Prime-1 Studio. Those are Museum Master Line statues and their first release was ROTF Megatron. The second release is DOTM Prime and the picture is the sample. The next one is DOTM 'Bee and the picture is its proto. 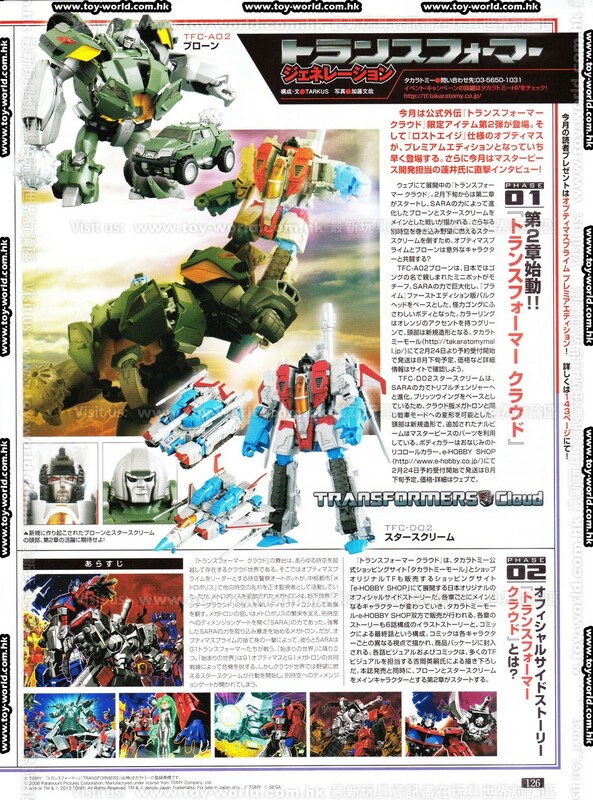 The article mentions they are also working on TFTM 07 Starscream. The one thing that really bothers me about the US Armada Starscream is the lack of paint of the chinstrap. Can anyone tell is the Japanese version does have black there? maybe im just in the dark but whats that alpha trion fig? we need a japanese member to be the official tfw translator for these matters. Anyone else see that minicon combiner set and think "Overlord"?